There are a few key elements to expect from a Morrissey gig: Eccentricity, unpredictability, stellar material and truly compelling stage presence. All of these were present in at least some capacity at Saturday night’s sold out show at the Aragon, but a straying setlist and gradual decline in firepower kept the performance from ever really hitting home. After a set of entertaining Britpop by The Courteeners and a video montage celebrating retro glam culture via the likes of Shocking Blue and the New York Dolls, a suit-clad Morrissey and his band kicked off their set with a spot on version of the Smiths classic “This Charming Man.” Punky new cut “Something is Squeezing My Skull” and Vauxhall and I’s “Billy Budd” kept up the momentum, as Moz growled and prowled like the showman fans have come to expect. Other highlights from the first part of the set included two more Smiths standouts - “How Soon Is Now” and “Ask” - as well as stronger cuts from 2004’s You Are the Quarry and the recently-released Years of Refusal. The later part of the set was far less essential, though, creating a noticeable disconnect between the singer and the crowd. Overloading the second half with deeper cuts such as “The World Is Full of Crashing Bores,” “The Loop,” “Best Friend on the Payroll” and “I Keep Mine Hidden” would have been fine if the quality of that material was on par with the set’s strongest moments, but it only created a take-it-or-leave it portion of the night that seemed to go on for far too long. A shame, considering the legendary front man has a catalog full of amazing songs to choose from. After a closing trio of tracks from Refusal, the band quickly left the stage, returning only for a meager encore of “First of the Gang to Die” off Quarry. While the track is one of Morrissey’s strongest efforts in recent years, the performance seemed rushed, with Moz half-singing, half-mumbling the lyrics in true “let’s just get this over with” fashion. And that was it. Nothing from Viva Hate. No “Bigmouth Strikes Again” and nothing from The Queen Is Dead. 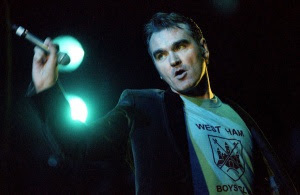 Two of the new disc’s strongest moments – “All You Need Is Me” and “That’s How People Grow Up – left out in favor of lesser cuts such as “One Day Goodbye Will Be Farewell” and “Sorry Doesn’t Help.” The only times the audience seemed to get genuinely excited were when the Moz ripped off his shirt prior to one of three wardrobe changes and when the band kicked into Smiths classics or punchier solo tracks. On a positive note, the singer was in fine voice, his band rocked and during the moments when everything fell into place, the formula delivered perfectly. It’s just unfortunate there weren’t more of those moments. 2 "Something is Squeezing My Skull"
5 "How Soon is Now"
6 "Irish Blood, English Heart"
7 "How Could Anybody Possibly Know How I Feel"
9 "I'm Throwing My Arms Around Paris"
10 "The World is Full of Crashing Bores"
11 "Death of a Disco Dancer"
13 "I Keep Mine Hidden"
15 "Seasick, Yet Still Docked"
16 "Best Friend on the Payroll"
20 "I'm OK by Myself"
21 "First of the Gang to Die"